Austin, Texas is already home to Whole Foods, but that won't stop a group of entrepreneurs from founding a new grocery store right in the natural food behemoth's backyard. While the new store In.gredients will also specialize in local and organic ingredients, there's one major difference between this venture and its hometown competion: In.gredients promises to be the country's first ever "package-free, zero waste grocery store." The idea is so simple, it's surprising that no one in the United States has implemented it yet. (The United Kingdom, on the other hand, got the bulk food-only Unpackaged in London last year). Just like many people bring tote bags to the grocery store, shoppers at In.gredients will be encouraged to bring their own containers to pack up items like grains, oils, and dairy. If a shopper doesn't have his own containers, the store will provide compostable ones. It's as if the specialty bulk food section rebelled and took over the rest of a traditional grocery store. In.gredients will replace unhealthy, overpackaged junk with local, organic, and natural foods, and moonlight as a community center with cooking classes, gardening workshops, and art shows on the side. “Truth be told, what’s normal in the grocery business isn’t healthy for consumers or the environment," In.gredients co-founder Christian Lane said in a press release. Americans add 570 million pounds of food packaging to their landfills each day, while pre-packaged foods force consumers to buy more than they need, stuffing their bellies and their trash bins: 27 percent of food brought into U.S. kitchens ends up getting tossed out. In.gredients's founders hope to open the grocery store's doors in East Austin this fall, provided that the funding goes through. 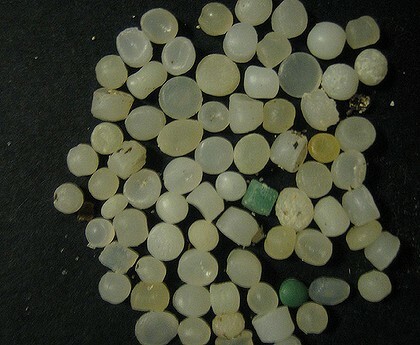 Plastic resin pellets collected at Watermans Beach pellets in August 2010. Millions of tiny plastic resin pellets, some containing harmful chemicals, which litter Western Australia's southern beaches, are thought to be contributing to the "inevitable" wipe out of the world's marine species. A report from the International Programme on the State of the Ocean, held at Oxford University, has found that overfishing and ocean pollution is killing fish, sharks, whales and other marine species far faster than predicted, and could result in a catastrophic extinction event. The international panel of marine experts said that conditions in today's oceans were comparable to conditions during "every previous major extinction of species in Earth's history" and there was a "high risk of entering a phase of extinction of marine species unprecedented in human history". 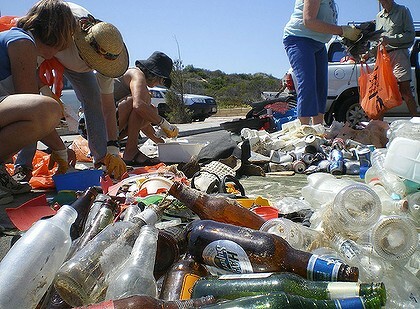 Volunteers sorting and recording marine debris collected at Binningup Beach during the 2010 South West Beach Cleanup. Alex Rogers, scientific director of IPSO, said when considering the cumulative effect of fertiliser run-offs, plastics, chemical pollutants, acidification and overfishing of the sea, "the implications became far worse than we had individually realised". Among these dangerous pollutants are plastic resin pellets, used in the manufacture of plastic drink bottles and other plastic ware. Made up of different chemicals, they absorb pesticides and industrial chemicals found in the ocean and form concentrated toxic pills for unsuspecting marine life, according to Tangaroa Blue Ocean Care Society officer Wally Smith. He said that among the more hazardous impacts the pellets could have, when accumulated in high doses, was creating hormone disruption and possible infertility. One plastic polymer widely studied for its impact on hormones, more specifically on the creation of oestrogen, was Bisphenol A (BPA). It was found to be almost as potent as a person's natural hormones back in the 1930s, but by the '50s it was also discovered that BPA molecules could be synthesised into a hard durable plastic, now found everywhere, Mr Smith said. "BPA is a fairly well-studied example of the transfer of oestrogenic chemicals from plastics into the human body and this is the process occurring in natural environments as well," he said. "Although studies directed at the actual transfer of chemicals from the plastic into marine creatures is limited." A variety of chemicals, many oestrogenic, also get mixed into the polymer to give it the desired properties of colour, flexibility, UV resistance and so on, he said. "These chemicals are never fully fixed in the polymers and migrate to the surface and escape," he said. "So some of the chemicals in discarded plastic quickly escape into the air or water and enter the food web." The chemicals found on plastic resin pellets in the Cape Naturaliste to Cape Leeuwin area several years ago were found to be low but did include PCBs (industrial chemicals), DDT derivatives (pesticide), and HCH (pesticides) - all of which were hormone disruptors. "No tests have occurred since then and the more appropriate testing regime in our view would be a local monitoring program over time covering a number of locations on the West Australian coast," Mr Smith said. "The tendency in Australia is to wait for overseas studies to prove these chemicals are affecting sea life. "This is unfortunate as we are now beginning to get an idea of the scale of marine plastic pollution and how extensive micro-pollutants such as plastic resin pellets are." These pellets can be found in the thousands, and sometimes millions, on a single WA beach. The pellets are often difficult to detect due to their size and colour against the sand and could take lifetimes to sift out of the continually varying seashore. However the South-West coastal clean-up action group, Tangaroa Blue, has been collecting and recording these pellets in a bid to trace their movements and potential hazardous affect on marine life. "We know some come from the Perth metropolitan area while others are carried here by ocean currents from distant countries," Mr Smith said. "Changing ocean acidity and temperature will affect the rate of release of chemicals from plastic and the subsequent toxicity of those chemicals. "This kind of change may well speed up and magnify the impacts on marine life." Tangaroa Blue is holding its annual West Australian Beach Cleanup Event on October 15 and 16. As awareness about plastic pollution around the world continues to grow, the plastic industry has been busy trying to save its business. This is true for bottled water manufacturers, but especially true for plastic bag companies, which haven't taken the anti single-use plastic movement easily and have been taking all kinds of actions to prevent people from stopping to use their products. On the PR side, they've launched campaigns like Save The Plastic Bag, which are flooding websites and media with sometimes misleading information: namely, that reusable bags may contain germs that could get your family sick if you don't wash them (duh: every piece of cloth can contain germs if you don't wash it, including tea towels, garments, cleaning cloths, etc.). On the legal side, they've sued cities that have banned plastic bags like Oakland, CA, Fairfield, CA, and San Jose, CA, arguing that the decisions were taken without proper environmental impact studies and asking for bans to be taken down. Unsatisfied with these practices, this business group seems to be taking the next step: filing suits against entrepreneurs that are standing up against single-use plastics. Such is the case of a recent lawsuit that three major plastic bag producers have filed against ChicoBag Company, a pioneering company in the reusable bag movement. The names in question are Hilex Poly Company, Superbag Operating and Advance Polybag, who are claiming that ChicoBag has infringed in 'False and Misleading Advertisement', 'Violation Of The Latham Act', and 'Violation of The Unfair Trade Practices Act' for some information included on its website. The facts in dispute include a quote supposedly taken from the EPA website claiming that "Reusable bags need only to be used eleven times to have a lower environmental impact than using eleven disposable bags", some clerical errors due to website formatting (references pointed to the wrong facts), and some statements related to the Great Pacific Garbage Patch. Now of course every business owner has the right to ask for explanations when someone is talking trash about one's work or product, and it might be true that a lot of misinformation about plastics is wrongly portrayed and deserves some rectification. But ChicoBag claims that it corrected the information that was wrong in its website within 72 hours of receiving notification of it. Nevertheless, the plastic companies continued with the suit. It seems at the very least curious that companies the size of these are taking it against a medium-sized business like ChicoBag, a business run by an entrepreneur that has been prominently active and vocal, standing up against wasteful single-use plastics. ChicoBag's founder, Andrew Keller, has been running his business like a non-profit, doing all sorts of actions to raise awareness about the over-use of plastic bags. In the summer of 2010, he toured the US in a 'plastic bag monster' suit raising awareness against the abuse of these and receiving a fair amount of attention in the media. Previously, he had testified before the State of California in support the ban of plastic bags and was a speaker at the TEDx Great Pacific Garbage Patch event. Again: plastic companies have the right to defend their product all they want, and it's up to consumers to decide what they want to do. But using their greater economic resources to shut the mouth of an environmentally conscious entrepreneur seems more like a case of bullying than of defending fair commerce practices. Keller (above) is now participating in the South Pacific 5 Gyres expedition that TreeHugger was invited to join, where he's trying to find out more about plastic marine pollution first-hand. "I've always tried to convey the most accurate information about single use plastics but it's hard to know what facts or articles are the most up to date and accurate. To compound the issue, the plastics industry has its own industry-funded facts and information which makes the topic extremely confusing to sort through. So I wanted to come here and see for myself first-hand, what's the impact of plastics on our ocean," he said about his reasons to join the voyage. Asked about the lawsuit, he preferred not to make statements until the process continues. However, we found that environmental organizations against plastic pollution -- including 5 Gyres -- are aware of the legal action and are planning to offer support. We'll keep you posted about how this issue unfolds. UPDATE: ChicoBag has put up a website to inform people about the lawsuit, you can check it out at www.SuedByPlastic.com. Coke and Pepsi's plant-based bottles still damage the environment. But despite all the buzz, Coca-Cola and PepsiCo's plant-based bottles are still very much plastic.The companies have merely replaced the fossil fuels (petroleum and natural gas) traditionally used to make their plastic bottles with ethanol from renewable sources (plant waste in Pepsi's case and Brazilian sugar cane in Coke's). Though these initial inputs come from renewable, lower-carbon sources, the resulting plastics are chemically identical to the polyethylene terepthalate, or PET,and high-density polyethylene, or HDPE, that regular plastic bottles are made of—a fact the companies acknowledge. And once the inputs become plastic, they carry all the same environmental impacts as plastic made from fossil fuels: They don't biodegrade, they pollute the world's oceans and soils, and still leach potentially harmful chemicals into our food. "They're just using plants to make the same polymers you find in other plastics. It has zero effect on plastic pollution," says Marcus Eriksen, a marine biologist who co-founded the non-profit 5 Gyres a few years ago to study ocean plasticization in areas like the Great Pacific Garbage Patch. Eriksen and his crew just finished exploring the world's five major oceanic gyres (slow-moving currents that create massive whirlpools where plastic can accumulate). They've found "plastic soup"—water thick with tiny bits of plastic—in all five. Eriksen's team and other researchers have also found larger chunks of plastic on the various islands scattered throughout the gyres, and in the bellies of dead birds, fish, and animals who fill themselves up with plastic bits that they mistake for fish and eventually die because they can't digest the stuff. Likewise, plastic—plant-based or otherwise—harms human health. The dangers of chemical additives commonly used in plastic, such as pthalates and bisphenol A, have been widely publicized; the two have been linked to obesity, autism, and various forms of cancer. "Some bioplastics formulations use the same types of additives as petroleum or natural gas-based plastics," acknowledges Melissa Hockstad, a vice president at SPI, a trade association for the industry. In other words, plant plastics are not necessarily free of BPA and pthalates. There's no way to know whether a particular plant-based plastic bottle includes these chemicals, since all plastic "recipes" are protected as trade secrets. But since traditional PET and HDPE manufacturers tend to use them to produce the right level of pliability and clarity, there's a very good chance that plant-based versions of PET and HDPE contain them, too. Hockstad says "some companies have been working on the development of bio-based" alternatives. But the key phrase is "working on the development of," as in, those additives don't exist yet and may never. That said, there's a kernel of real progress amid the plant-plastic hype. The new bottles reduce the use of fossil fuels and improve recyclability. But there's a big difference between "recyclable" and "recycled." While all bioplastics are technically "recyclable," current recycling systems are not set up to recycle those that don't mimic existing plastics. The most common bioplastics include polylactic acid, which is made from corn starch, tapioca, or sugar cane. When these bioplastics arrive at a recycling center, they are separated out as waste. In this sense, Coke and Pepsi opting to create plant-based HDPE and PET instead of other bioplastics is applaudable. They should also commit to using recycled material in their packaging. In 2001, Coca-Cola pledged to use 10 percent recycled plastic in their PET bottles by 2005. It achieved that goal, promptly dropped its commitment to using recycled content, and now evades precise accounting with statements like, "We are working to advance technologies that allow us to use greater amounts of recycled materials in our packaging." 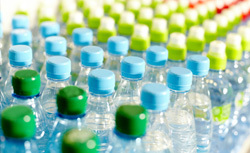 The bottles currently produced by major bottling companies use about 4 percent recycled content, according to Susan Collins, executive director of the Container Recycling Institute. There's no question that setting up collection facilities and integrating recycled material into the production stream is expensive. But several companies are already doing it, Collins says. Naked Juice, Naya Water, Eldorado Water, and Rainbow Light Nutritional Systems, for example, are all using 100 percent recycled plastic in their bottles. Meanwhile, Coke and Pepsi are spending millions on a plant-based version of the same old packaging and touting it as an environmental leap forward. Don't be fooled: It's a sidestep at best. June 8 is World Oceans Day – a growing global celebration of the big blue body of life that covers 71 percent of the earth’s surface. Yet, at a mind-numbing rate, humans are littering the sea with debris to the point that the UNEP report cited above estimates “over 46,000 pieces of litter are on the surface of every square mile of ocean today.” Seabirds, turtles, seals, sea lions, whales, and fish all suffer from marine debris entanglement and ingestion. One affected bird is the Laysan albatross. At home in remote portions of the North Pacific, the Laysan albatross feeds on squid and fish eggs floating on the surface of the water. Mistaking floating plastic for food, the Laysan albatross feed plastic to their young. Scientists report that on Midway Atoll, as many as half of the albatross chicks born each year die of starvation. Inside the dead birds stomachs scientists find bottle caps and other discarded plastic items ingested instead of food. At the Monterey Bay Aquarium, a Laysan albatross named “Makana” teaches visitors about the threats albatross and nearly one million other seabirds face from plastic pollution. I met Makana and Sarah-Mae Nelson, the Aquarium’s Climate Change Interpretive Specialist, last month at their daily program on plastic pollution. Living on the edge of the Monterey Bay for most of my life, I have waited many years to see an albatross. Every boat trip out to sea, I would watch the sky hoping for a glimpse of one of these large magnificent birds. I never expected my first sighting to be in an interview that included scratching Makana’s head. But unfortunately, it is not. Thousands of containers go overboard every year filled with both recycled and virgin plastic materials, according to Nelson. One ship recently lost 10 million plastic bags, never before used, that went straight to the bottom of the sea. The daily programs with Makana inspired Nelson to commit to a plastics-free year to show others, for lack of a better phrase, we can turn the tide on this issue. “I really think that a national identity as a consumer aware public needs to be reestablished.” For me this awareness means refusing single-use plastic, renewing or repurposing plastic instead of throwing it away, and precycling before purchasing. The name “Makana” means gift in native Hawaiian – a far stretch from the metaphorical “curse” the term “wearing an albatross around your neck” implies. In the case of marine plastic pollution, we all carry the burden of the “albatross” until we make the necessary changes. We are all lucky to have the example of Makana, this beautiful sea bird, and Sarah-Mae Nelson to show us the way. For more information about what you can do, visit the Monterey Bay Aquarium's Ocean Issues page on Albatross & Plastics. - Ed. Katharine Daniels is the founder and executive editor of The WIP. This short movie by Kyle Thiermann of Surfing For Change, tracks a plastic bag from Santa Cruz, California, all the way to the North Shore of Oahu, Hawaii, demonstrating both the destruction and solutions of plastic pollution along the way. Kokua Hawai'i Foundation founder and president, Jack Johnson, Story of Stuff's Annie Leaonard, and Plastic Free Haleiwa's Lee Roy are all featured in this fast-paced journey to highlight the power we all have to end plastic pollution. Labels: Bag Bans, Hawaii, What Can You Do?